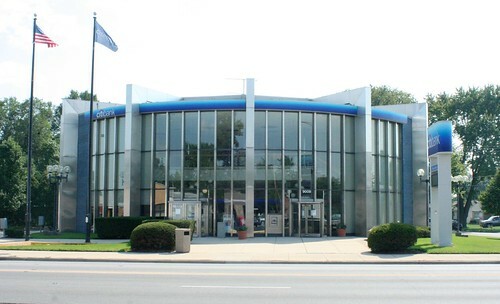 Brookfield Federal Savings & Loan dates back to 1925, and opened its Ogden Avenue headquarters in June 1961 with a opening day celebration that included free gifts and “free orchids for the ladies”. 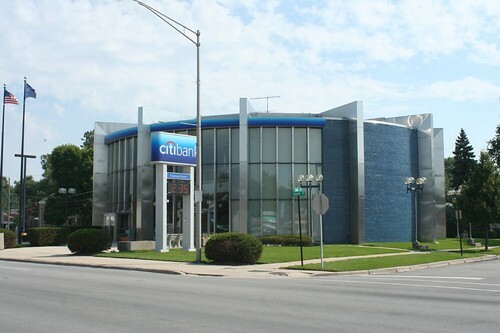 Architects for the new bank building were Pavlecic and Kovacevic (previously Pavlecic and Kovacevic & Ota; later Pavlecic, Kovacevic & Markovich) a Serbian firm who also designed St. Gall Catholic Church at 55th and Kedzie. Architects William Pavlecic and Rodoslav Kovacevic brought a beautiful modern design to the site. 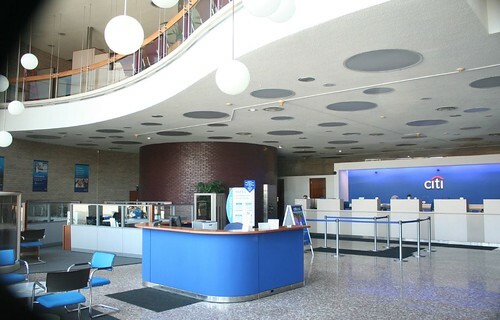 A full circle, the bank is lined by stainless steel-clad columns around its perimeter. Inside, period elements include a wonderous suspended stairway to the mezzanine level and a constellations of hanging globe lamps. 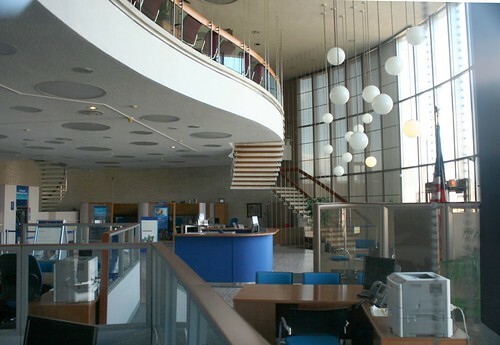 A two-story wall of glass in front gives generous natural light to the interior (a 1963 ad by glassmaker Libbey Owens Ford touts the bank as an “Open World design” for a modern-day “money store”, enhanced by their Thermopane insulating glass.) 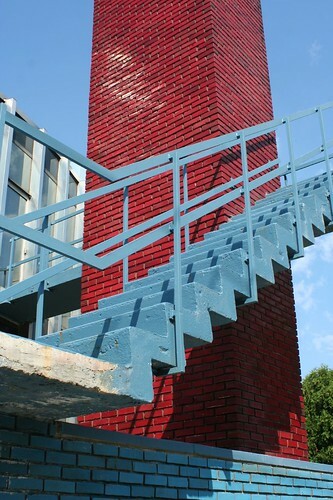 Blue glossy glazed brick fills in the back exterior walls, while red and maroon brick forms points of contrasting color at the rear smokestack and in an interior wall. 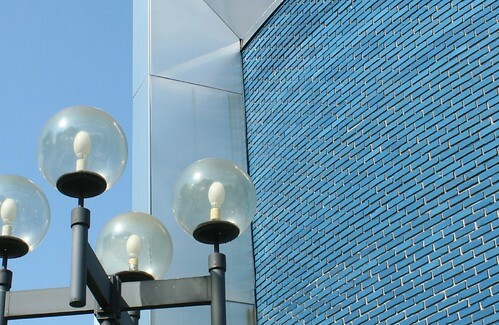 In 1985, Brookfield Federal Savings changed its operating status and became Brookfield Federal Bank for Savings. 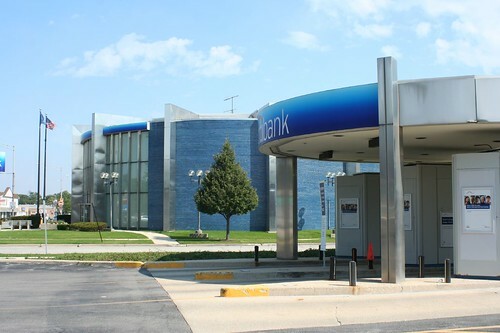 Six years later, in 1991, it was bought out by CitiBank, who continues to operate the property today – and have been remarkably good caretakers. 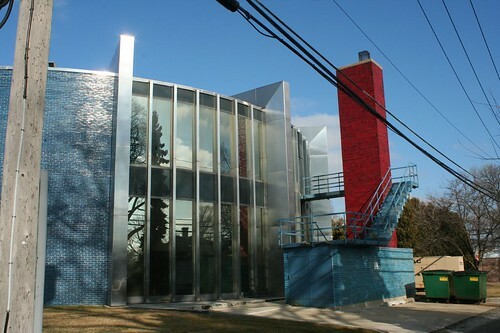 In addition to St. Gall, Pavlecic and Kovacevic also did the modernist design of St. Jane de Chantal at 53rd and Austin in 1964, Christ the Mediator Lutheran Church at 31st and Calumet, and St. Simeon Serbian Orthodox Church, a more historically based building at 3737 E. 114th Street. 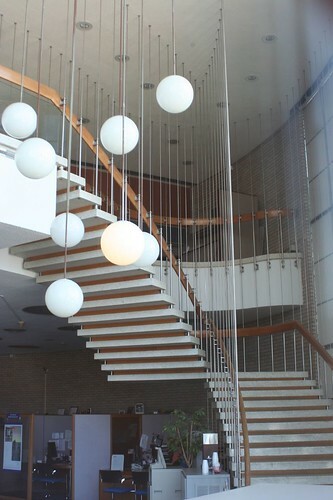 This entry was posted in Mid-Century Office and Commercial, Midcentury Modernism, South Suburban. Bookmark the permalink. As usual, a great set of observations. 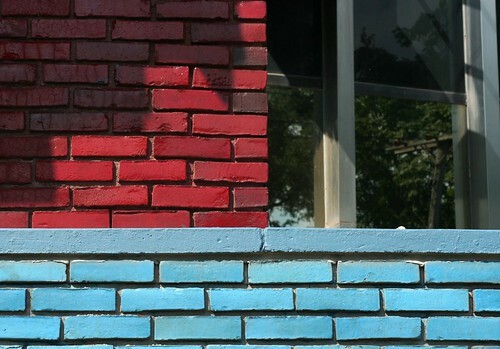 I pass this all the time and now will have more appreciation of its uniqueness. Thanks. Wow, this building looks amazing. Nice find!! My father is William Pavlecic, architect. I can provide much more information about the building and its construction. During the foundation work the steel fabricator marked a hundred dollar bill for the concrete foreman and said it was his if the circular steel frame fit the circular foundation. It did.